Jonathan Newell finds out how Building Information Modelling has helped plan a modular cleanroom installation. Installing a cleanroom into an existing facility with its inherent dimensional, access and other constraints was never likely to be an easy undertaking and certainly not cheap if using a bespoke construction project. The notion of using modular cleanroom constructions reduces the cost somewhat but how can large modular rooms and space sensitive locations find an appropriately harmonious marriage? One approach, as used by modular cleanroom specialist, Connect 2 Cleanrooms, is to make use of the latest construction industry software and technology and apply it to contamination control facilities. The software and approach used by Connect 2 Cleanrooms is Building Information Modelling (BIM) and this was instrumental in the success of the company’s largest off-site cleanroom construction project to date, the installation of a Monobloc panel system for global medical products and technologies company, ConvaTec to assist with the manufacture of wound dressings. To meet the increasing demand for controlled environments for its products for advanced wound care, critical care and infusion devices in the healthcare industry, ConvaTec required a new cleanroom to be aligned with their current facility, where the corridors incorporate windows and doors. The company also needed the ability to expand further in the future. To ensure an accurate design in an already space-sensitive facility, the use of Building Information Modelling (BIM) assisted the design stage for Connect 2 Cleanrooms. The Point Cloud 3D design software allows for a more accurate design, shorter lead times and a more cost effective approach. Improved communication and coordination between departments and clients provides a greater understanding of the design intent and allows for any errors to be identified and changes to be made at an early stage, thus reducing waste and saving money. Spanning 951m² and with a requirement to achieve ISO class 8, the cleanroom incorporates a separate change area suitable for up to 60 operators and a material transfer area. The main cleanroom area, which was constructed to house ConvaTec’s stitch bonding processes, has a footfall of 870m² and is designed to achieve 21 air changes per hour. The cleanroom design incorporates high speed and hinged interlocking doors between the transfer and change areas to aid the flow of materials and personnel, whilst reducing the risk of contamination entering the cleanroom and in keeping with the aesthetics of the existing sensitive layout. At nearly 900 square metres, the cleanroom is at a scale similar to being able to house a couple of dozen large buses so the monitoring of critical parameters and the control of air flow is crucial, particularly during high usage and other potentially contaminating events such as staff shift changes. The cleanroom has 60 variable speed controlled HEPA ceiling fan filters, which are all accessible externally via a suspended walkable ceiling to enable non-disruptive maintenance. 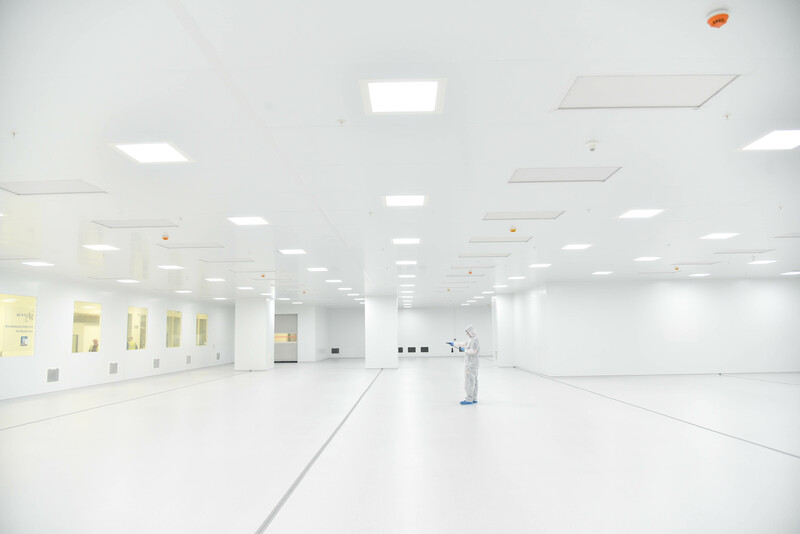 A cleanroom of this size would typically use an Air Handling Unit (AHU) to supply HEPA filtered and temperature controlled air. However, Connect 2 Cleanrooms proposed the use of localised air conditioning and dehumidifier units to supply processed air to fan filter units. This approach meant a significantly lower initial investment and it is more energy efficient when operational than an AHU. ConvaTec uses Connect 2 Cleanrooms’ ECO loop control system with temperature and humidity control for monitoring crucial environmental parameters within the cleanroom. The ECO loop control system provides greater energy efficiency over conventional cleanrooms by continually monitoring contamination levels and pressure, adjusting airflow dynamically to ensure that energy usage is kept low without taking the room out of classification. A bespoke touch screen control system was installed to continually log all these data parameters, which integrates with ConvaTec’s current BMS. The integrated alarm alerts operators when these parameters vary beyond a specific threshold such as pressure differential and temperature & humidity. Following the installation, a detailed commissioning process was carried out to ensure the cleanroom is functioning as it should. Extreme testing of all elements, alongside the design against resilience, ensures the room continues to operate around the clock without a break even if a unit fails. With increasing business demands and the ever growing need for a less disruptive construction and more efficient design process, Connect 2 Cleanrooms is consistently looking for new processes to offer more accurate and effective designs coupled with a reduction in installation time for its modular cleanrooms. The company does the design and manufacturing of its hard and soft wall cleanrooms in-house and delivers ISO 14644-1:2015 standard compliant products. The introduction of Building Intelligence Modelling (BIM) is another investment added to the company’s design portfolio, offering customers a more efficient and accurate service. Through BIM, the UK construction industry is experiencing its very own digital revolution, combining efforts of people, processes and technology and Connect 2 Cleanrooms decided to apply this to its own operations. According to Joe Govier, Managing Director of Connect 2 Cleanrooms, the use of BIM allowed the company to think beyond CAD drawings and more towards data to help it understand the building to be occupied, so Connect 2 Cleanrooms could apply its technology more efficiently. “By analysing historic data and understanding the length of time to complete our cleanroom installations, we could forecast our activities and the time taken from inception to installation of the cleanroom, which meant we could optimise our people and processes more effectively, making cost and time savings,” said Govier. Building Intelligence Modelling is a process for creating and managing information across a project’s lifecycle. One of the key outputs of this process is the Building Information Model, the digital description of every aspect of the built asset. This model draws on information assembled collaboratively and updated at key stages of a project. Creating a digital Building Information Model enables those who interact with the building to optimise their actions, resulting in a greater whole life value for the asset. At ConvaTec, a point cloud 3D scan of the entire building was conducted within the initial stages of the project to provide a virtual view of the space the facilities occupied. A Point Cloud is a collection of data points defined by a given coordinates system. In a 3D coordinates system, for example, a point cloud may define the shape of some real or created physical system. The point cloud was then used within the overall model created for the project to ensure all aspects of the current facility were taken into account in the final design. Jonathan Newell is a graduate of Loughborough University and has three decades of experience in engineering as well as broadcast and technical journalism.